The EU SME Centre has recently published a webinar on Imported Food & Beverage distribution in China, presented by Daniel Pedraza, our China Director. In this webinar we discuss how food distribution has evolved over the years, highlighting the increasing growth of e-commerce and its impact on China’s F&B sector. We as well talk about importance of convenience stores, the fastest-growing sales channel in traditional retail in China in the recent years and why supermarkets are changing their business to fit better into the convenience trend. 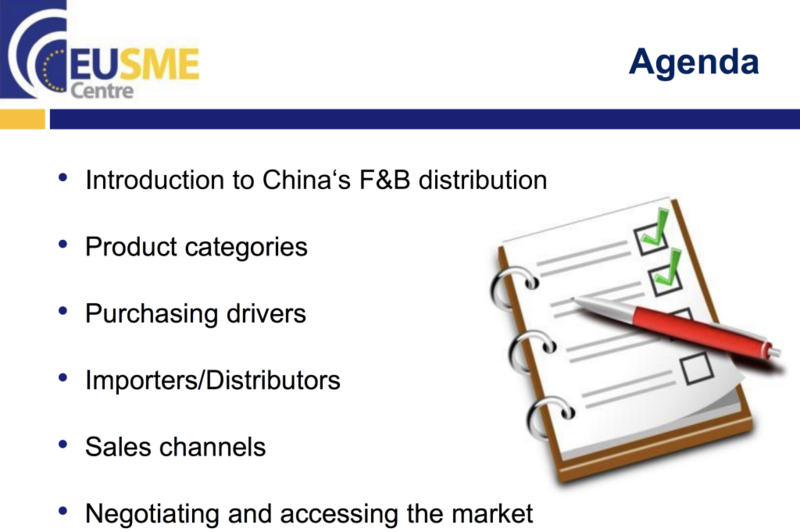 We provide an overview of product categories currently exported from the EU countries to China such as meat and alcohol which are the two largest categories, describe main characteristics of importers by category and market position, and outline the key drivers that influence consumer and importer purchasing decisions such as price, marketing image and value for money among other factors. In addition, we determine main factors to consider when entering Chinese market and provide recommendations. The final part of the webinar focuses on the most relevant aspects for all sales channels, i.e. traditional retail, E-commerce and foodservice. For further insights, please access the webinar from this link.